IN THE quest to develop new high-performance polymers, one area of interest is to consider the orientation of the material at a molecular level. Speaking at Pittcon 2012 in Orlando, Florida, this week, Professor Bruce Chase of the University of Delaware gave a keynote presentation on the structure and orientation in electrospun nanofibres. A key element in this is the spatially-resolved measurement of molecular orientation, determined by a novel technique which combines atomic force microscopy (AFM) and infrared (IR) spectroscopy. Measurements were made using a new AFM-IR instrument from Anasys Instruments, also unveiled at Pittcon. 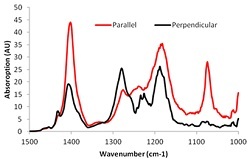 The company has added arbitrary polarisation control to its NanoIR infrared spectroscope, which enables the user to both visualise and measure the molecular orientation of a sample, with spatial resolution measured in nanometres. Measuring the infrared absorption as a function of polarisation angle, it becomes possible to identify regions of a sample that have a high degree of molecular orientation.